for your car?!?! I’m talking Motor Oil!!! I bet you were thinking something else, weren’t you!?!!! You may remember a few weeks ago I posted about doing a project for SOUP ab0ut Castrol Magnatec Motor Oil. If you missed it, you can read it by clicking here. After some hiccups with Australia Post, and the silly season, I finally received my information pack so that I can share with you! Engine Oil is the life blood of the vehicle. The better you buy the better protected you are. That sounds familiar! The better you buy, the better protected you are. I always believe that you get what you pay for. 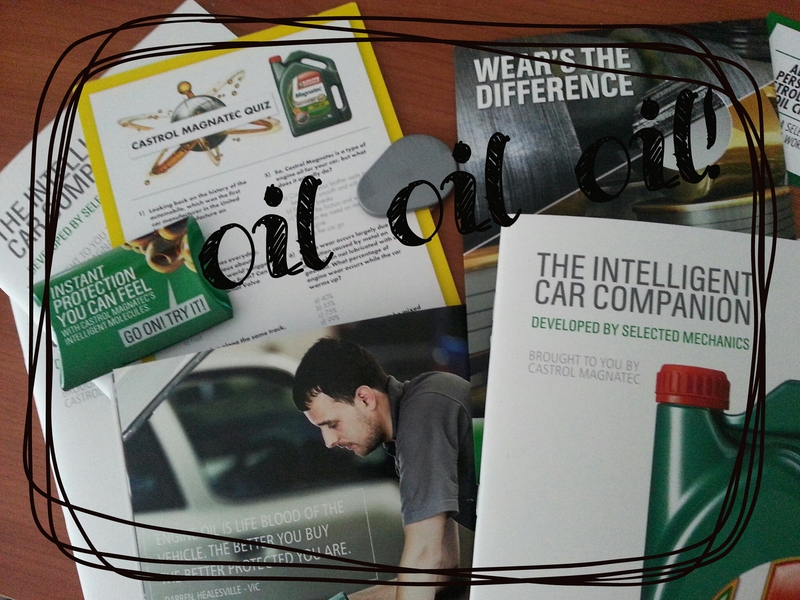 According to my fancy information sheets, the Castrol Magnatec Oil has intelligent molecules that cling to the engine, and they don’t drop off once the car has stopped. Pretty fanceeey! I’m in my car every day, taking the kids to and from school, running errands, going places! Over the next week I’ll be taking my trusty Mazda Tribute in for an oil change, after I’ll be back to let you know how it runs. I’m looking forward to a difference! I’ll leave you with this fun ad they’ve produced, which explains a bit about the technology. Who knew Engine Oil was so tricky!!!! Have you heard of Soup? No, I’m not talking about that yummy, winter goodness that makes you feel better on cold days, or when you’re sick. I’m talking about The Soup.com.au – a company that lets you do some market research in the comfort of your own home. I’ve been applying to Soup projects for a while now and have received some pretty awesome products to test out. There’s never a lack of interest in our house, especially with the 3 young children, and their friends and families. This new project I’ve been assigned is all about Meadowlea margarine. It’s called the “lunchbox switcheroo” and I’m very excited to be an ‘official blogger’ on the project. Having children that are huge toast and sandwich lovers, I quite often find myself muddled over to what is best to put on them. They’re quite the ‘fussy’ lot, however there is always a request for something ‘under’ the Vegemite. I thought this project would be perfect for our family! When looking at children’s nutrition, in my opinion it’s always good to be looking for a whole food approach. 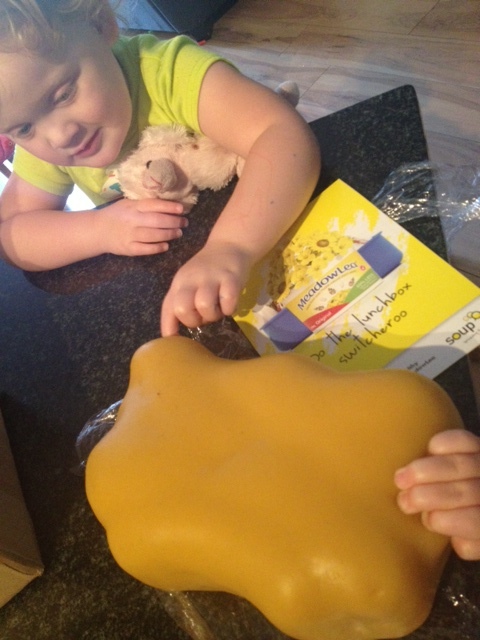 I was absolutely astounded to read then, that by making the switch to Meadowlea you can save your kids 2.5kgs of saturated fat. If I’m saving my kids that, and I’m also eating toast/sandwiches, then I’ll be saving myself that too. This is a very good thing! 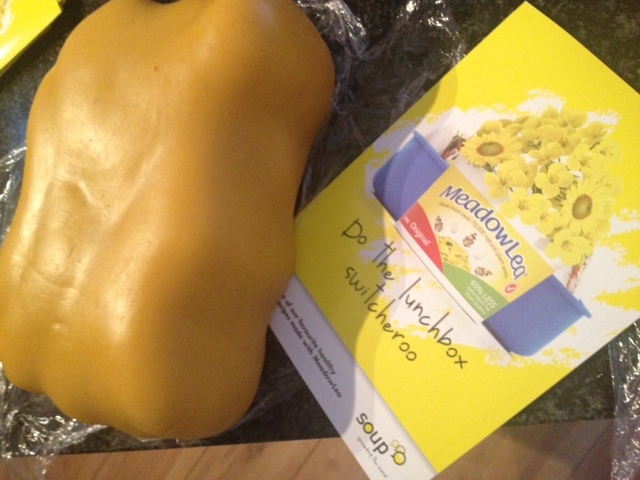 Check out these photos of what 2.5kgs of fat looks like. The kids thought it was ‘gross’ hahahaa! Ewwwww…. And to think.. in the past year I’ve lost at least 6 of these blocks, off my body. Wow!!! Puts all the food choices into perspective! Meadowlea is also 65% less saturated fat than butter, as well as being a natural source of Omega3, good for healthy heart function and general well-being. For the next month, I’ll be making the switch. I’ll be reporting back as to whether the children have loved it, hated it, or not even noticed! I’ll also be running a competition in a few weeks, with the winner receiving a $50 gift card, so stay tuned for details on that! For now..I’m off to think of fun and creative things for the ‘lunchbox’….